Summer has officially begun, and warmer temperatures are finally headed our way here in Seattle (we hope!). Summer weather makes for great travel conditions, but it puts stress on your cooling system that can bring any weak components to their breaking point. A thorough check-over of your TDI’s cooling and air-conditioning systems at the beginning of the summer travel season is a good idea to ensure reliable, trouble-free operation through the warmer weather. 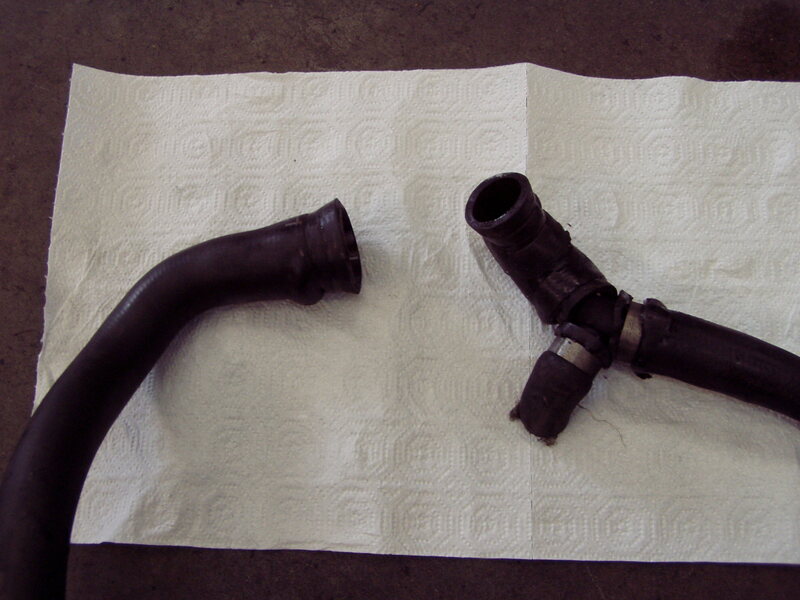 1996-2003 TDI’s are prone to fuel leaks from the injection pump caused by use of ultra-low-sulfur diesel (ULSD) fuel. In many cases these leaks are intermittent (leaking more when running diesel, and generally leaking less or not at all when using biodiesel as shown in our YouTube video here), and the leaks may not be severe or consistent enough to make a noticeable difference in the car’s operation. However, over time, the occasional drips of leaking fuel can damage and weaken the coolant hoses that run directly beneath the injection pump, putting them at risk for rupturing just when it is most inconvenient. It is critical to catch a failure like this before it happens and results in an overheated engine, which can lead to major damage and repairs. If your hoses show any signs of flaring, blistering, bulging, or softness like those shown above, or you can smell fuel odor under the hood, make sure you repair the compromised hoses and get the source of the fuel leak fixed before this comparatively minor problem turns into a much more serious one! The water pump on most TDI’s is driven by the timing belt and hidden from view, making it difficult to detect any coolant leakage there and take preventive action unless the leak is already severe. A new water pump should always be installed whenever the timing belt is being replaced as a preventive measure, and good-quality pumps usually last at least the lifetime of the belt (40 to 100k depending on model), but we have seen pumps leak as early as 60k so there are always exceptions to the rule. A thorough pressure test is the best way to reveal any hidden problems while they are still in their early stages, and ensure that the system is healthy and leak-free. TDI’s are also susceptible to failures of the original-style coolant temperature sensor, which can cause a variety of problems from poor starting to a check-engine light. An updated part is available (recognizable by its green color, compared to the black of the original-style sensor) that is more reliable, and the part is cheap, so if your car still has its original sensor it’s a good idea to have it replaced preemptively if the coolant has to be drained anyway for another repair. Keeping your engine cool is not much good if you can’t stay cool yourself. TDI’s are equipped with great air conditioning systems, but they depend on air flowing across the car’s radiator and condenser to function effectively. This means your car’s radiator fans are a critical part of the system, especially when you are stuck in traffic. VW’s have two dual-speed electric fans to pull air through the radiator and A/C condenser. Oftentimes those fans will fail in such a way that they still work on the high speed, which keeps the engine coolant from overheating, but no longer function on the low speed, which means your air conditioner has to work overtime to keep cooling at low vehicle speeds when there is no air flowing across the condenser. The high temperatures and pressures that arise in the system under these abnormal conditions can cause the compressor and other A/C components to fail prematurely, resulting in expensive repairs. Having the radiator fans’ operation checked and, if necessary, fixed can go a long way towards keeping both you and your A/C system comfortable and happy this summer. Finally, if you suffer from seasonal allergies, you can rest easy knowing that your TDI is equipped with a pollen filter that is designed to keep allergens out of the cabin. But… when was the last time that filter was changed?? As the charcoal pollen filter ages, it loses its effectiveness and gets plugged with organic debris. Replacing the filter with a new activated-charcoal element will make your travel experience much more pleasant. Give yourself some extra peace of mind and avoid potential trouble on the road this summer by giving your TDI a full seasonal check-up and making sure all cooling components are up to the task of whatever the weather may bring. A cool, happy car means cool, happy travelers! what do you charge for a tune-up with oil change and oil filter? What is the cost of changing the timing belt and checking the water pump? We charge $85.00 plus tax for a TDI oil change, using 5W40 full synthetic diesel-rated oil (505.01 spec in the case of PD cars) and a Mann or Mahle filter, parts and labor. That also involves a general visual check-over of brakes, front end components, any leaks, etc, while we are under the car. A full timing belt replacement on an ALH TDI (1999-2003) runs $915 plus tax, and that always includes a new German HEPU metal-impeller water pump (along with a list of other new components that should always be replaced with the belt). On a PD (2004-2006) car it costs $781. The additional labor to change the water pump during a timing belt service is minimal compared to what it would cost to replace it separately later on, and the pump is driven by the belt which means that if the water pump has a failure, it will throw the timing belt and cause major engine damage, so we consider a new water pump to be a mandatory part of a proper, complete timing belt replacement on a TDI. I have a strange heating/AC issue with my ALH Jetta. After driving a few miles the AC shuts down and the HVAC system starts blowing hot air as hard as it can (regardless of the setting). There is plenty of coolant, the fans on the radiator are both running, and the AC works when we first turn the car on. I’m thinking the thermostat is no longer opening, ideas? I’ve heard something about replacing the timing belt with something more reliable, longer lasting. Is there such a thing? The main thing to consider is replacing the parts that touch the belt during the belt replacement. Here at Dr. Dan’s we replace the belt and other parts as a high quality kit. Where are you located?